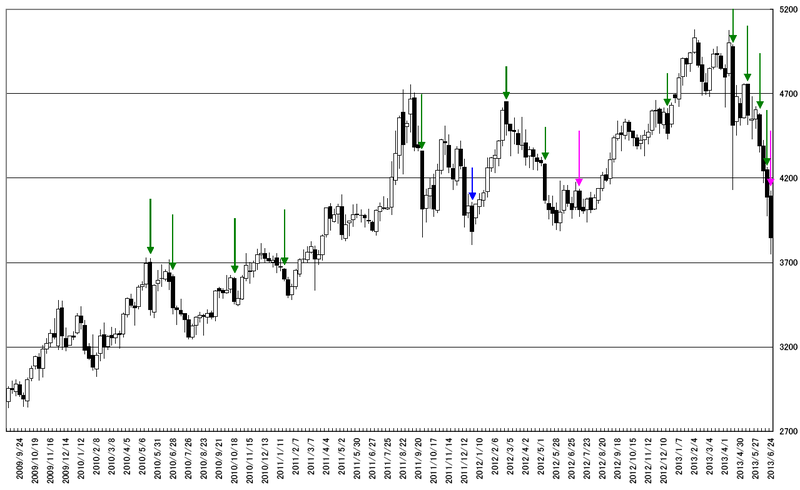 Tokyo market gold monthly calculated in yen; bullish market will going on in long term. Today we analyze Tokyo market gold monthly calculated in yen. Does Gold market bullish market has ended? The answer is only written on the chart. Today, we confirm by trend lines. First is blue trend line. This line is outer side resistance. Cutting the blue support line, some one says “Gold bullish market has ended”. This line worked as support line in this month. And the resistance line also worked at the highest and over shouted. This is one of the re-bullish proofs. Our best notable lines are pink and orange lines. 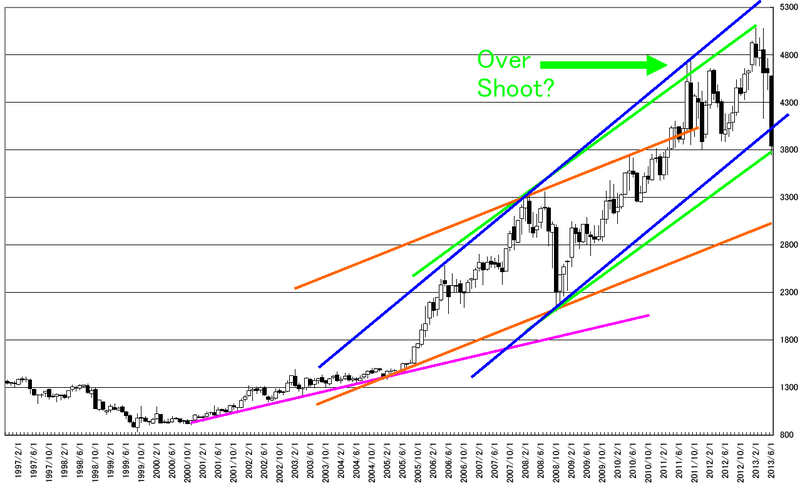 If it will be the real bearish, the market price will cut this line. 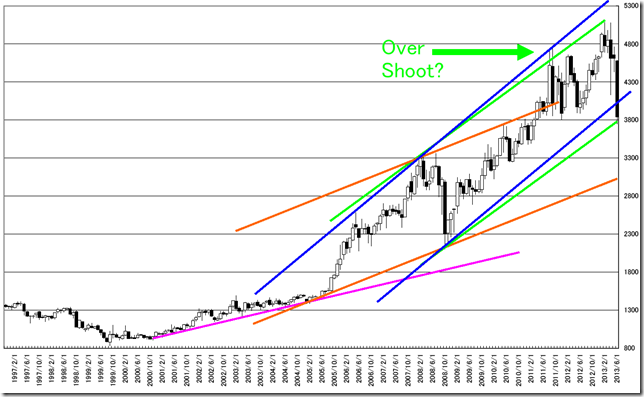 Our conclusion is bullish until cutting orange line. Tokyo market gold weekly calculated in yen; “HAGURO” No.12 (13) formation; there is an edge of cutting with candle stick body. Today we analyze Tokyo market gold weekly calculated in yen. In past 200 weeks, it appeared 16 times. This week candle stick type is difficult to judge. Our regular filter says it is “HAGURO” No. 16(10) formation but it is very close to “HAGURO” No. 12(13) formation. In this week case, we think we should judge it as “HAGURO” No. 12(13) formation. If we treat it as “HAGURO” No. 16(10) formation, it will be steadiness. And if we treat it as “HAGURO” No. 12(13) formation, cutting with candle stick body will be the market trend.